This Sunday we hear again the often quoted statement by Jesus: “Give to the emperor the things that are the emperor’s, and to God the things that are God’s.” (In many translations the word ‘Emperor’ is translated as ‘Caesar’.) Of all the bible versus in the New Testament this is one of the most commonly quoted. Unfortunately, most use this quote and forget that Jesus made this statement to squelch the voices of his opponents who were trying to get him to say something that would offend the Roman authorities. For years’ I have mulled over what this statement really means. Every time I hear some one say, “Give to Caesar… and to God….,” it is usually in the context of some discussion on the separation of church and state. But, I don’t believe that such a separation is realistic or really possible, if by church we mean God’s ways. Just imagine Caesar standing before God and saying: “You do what you want with what is yours, and I’ll do what I want with what is mine.” Ridiculous sounding, isn’t it? What ultimately belongs to Caesar? Nothing! Absolutely nothing! And, we as Christians all know it. Caesar’s very life comes from God, as does everything else in the universe. If by church, however, we mean ‘church leadership’, then I think this little passage does lend itself to a form of separation of church and state. Leaders from both groups should be able to discuss, dialogue, and share concerns, but there really needs to be a separation, especially, in our modern a pluralistic world. People of all backgrounds and beliefs need to know that there is a real distinction between civil government, and church government. When the two become intertwined a sort of cloudy murkiness develops in leadership, and people no longer trust either government. Each government exists for distinctly given reasons, and when they become enmeshed they loose focus, meddle in each other’s affairs, and ultimately loose the trust of the people. 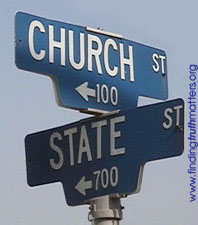 Was Jesus making this distinction between ‘God’s Ways’ & “Church Government” when he made this statement? Probably, but we should always remember the context in which he made the statement. It was a response to a hostile and trick question! When we ignore the context and interpret the statement literally, we get ourselves in trouble. This is how some have reached the outlandish conclusion that God has nothing to say about Caesar and Caesar’s ways, and thus advocate a false distinction between church and state, as if this was possible. People bring their beliefs and values with them wherever they go, and of course they bring them to civil government.